1. <morgen> [noun] [de morgen, de morgens]. Ad 1. "morning", the period from the start of the day till noon. 1. "Frank is altijd nors in de morgen." 2. "Morgen zal alles anders zijn." 3. "Ik zie je morgen!" 1. "Vanmorgen" or "vanochtend": this morning. "Vanmorgen stond er in totaal 565 kilometer file." 2. "Overmorgen": the day after tomorrow. 4. " ‘s Morgens " or " ‘s ochtends ": in the morning (from the historic second possessive case (genetive) "des morgens" or "des ochtends"). "Frank is ‘s ochtends nooit op z’n best." 5. "Morgenstond": the early morning (hours), dawn. "The early bird catches the worms", literally: dawn has gold in its mouth. 6. "Ochtendhumeur": bad morning mood. 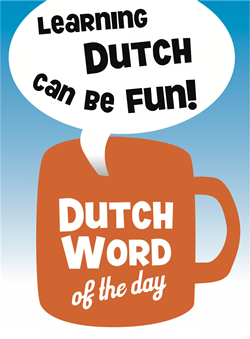 This entry was posted in Dutch word of the day, DWOTD 1.0, Vocabulary Basic and tagged morgen, ochtend by Dutch Gurus. Bookmark the permalink.